BNR has listened, and created a custom Autocal configuration that will allow this. 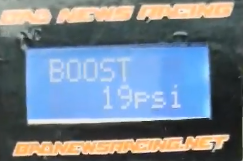 Before proceeding any further, make sure you're using the current EFILive build, which can always be found here- http://www.badnewsracing.net/EFILive/EFILiveV8_Setup.exe and that your Autocal is on the latest firmware. Once this has finished, you can go to the car, plug in the Autocal, and to go DISPLAY DATA. You'll see all the new user-friendly parameters there and can scroll through them!